The Skinny: Flawed but engaging, this drama from Milky Way Films is affecting despite its exposition overload and stock characters. Latest in the Milky Way canon is their definition of warm and fuzzy. The title harks back to Johnnie To’s overwrought All About Ah-Long as both are about immature men who find a means of growing up. That’s where the similarities end. Lau Ching-Wan is Michael (wordplay on Dai Gor or Big Brother), a debt-collecting triad who checks into the small International Hotel the night after his release from jail. His first act is to get into a fight with three cabbies whereupon he gets dragged off by the cops. The hotel’s proprietor, widow June (Ruby Wong), engineers his release as he was not the aggressor - the cabbies were. Ah Long goes free and such begins the slow burn romance between ex-con and widowed mother. Despite his uncouth and violent nature, Ah Long take a shine to the emotionally distant June and her son Tony. However, his adversaries are not so quick to let him go. The cops and cabbies gang up on Ah Long, trying to exact their revenge or prejudice on him one way or another. It’s not entirely undeserved; Ah Long is a typically defiant triad, and we grow to learn that it’s all he knows. Jail is home to him, and he intends on living his life there if he doesn’t get killed first. For some reason something in the International Hotel changes him. He finds a sense of family and responsibility, and if you haven’t heard this plot before then you really should see more movies. The tale of gangster who tries to go straight is a tried and true movie cliché. It’s practically a genre itself, which is appropriate because the guys at Milky Way make genre their business. This is an excellent production highlighted by effective performances. 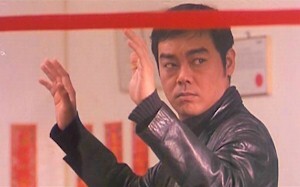 Lau Ching-Wan brings his typical charisma to the staple character of Ah-Long. It’s not a terribly subtle performance, but it gets the job done. Ruby Wong doesn’t do much more than refuse to smile, but she brings a quiet dignity to June. However, this film wouldn’t be getting any praise if it weren’t for the direction from Johnnie To and Patrick Yau. This is a drama, but their pacing and construction bring a light quality to the proceedings. Somewhat akin to Yau’s The Odd One Dies, Where a Good Man Goes works best when it asks us to understand the characters through their actions, or sometimes their inaction.